This image is a bit of an oddity for me. I’m usually sharing images of plants, wildlife, landscapes or some of my abstract impressions. Today, I’m sharing a snapshot of a moment in my life. You see, today Canada celebrates 150 years as a nation. A nation I am so proud to call home. A nation where I can travel freely, enjoy incredibly diverse environments. A nation where, quite frankly, I can simply enjoy life, with friends and family. Times where we share our days, our experiences, often over a cool beverage at the end of the day. This image was an impromptu iPhone composition, made while sharing a beer with my neighbours. The ‘stubby’ beer bottle disappeared from Canadian breweries in the early eighties, in favour of a ‘better’ design. The long necked bottle, yet there is a nostalgia, Canadiana to the stubby. 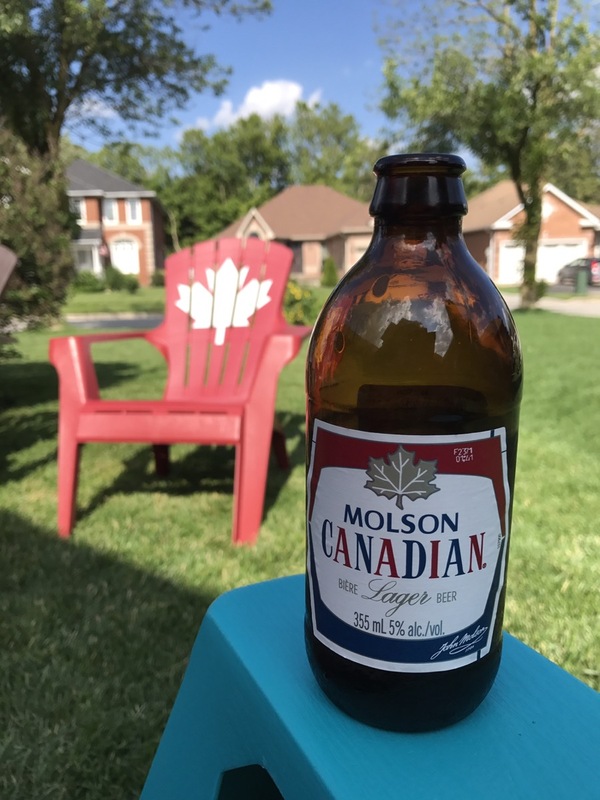 In celebration of Canada’s 150th anniversary, one of the breweries, Molsons, which makes Canadian Lager, brought the stubby back for a brief time. So, it was a great opportunity to capture this memory. The stubby bottle of Canadian, with a muskoka chair and my neighbourhood in the background as an appropriate starting point to the upcoming celebrations. Happy 150 Canada. This entry was posted in Photography, weekendcoffeeshare and tagged beer, Canada, celebraton, friends, neighbours, nostalgia on July 1, 2017 by Ed Lehming Photography. I’d tell you about how beautiful the past week has been. Temperatures, though up and down, have been getting milder, my favourite wildflowers are beginning to bloom, and the trout are running up Duffins Creek. The annual cycle of spring is in full swing. These are the days I can barely stand to sit inside working, but work has to get done. Yet, I’m fortunate to live very close to many hiking trails and creeks that I can enjoy during my lunch time. And then, there are weekends where the trails beckon for longer visits, weather permitting. Today, I went for a hike with my son, who also enjoys the outdoors and photography. We visited the dam at Whitevale, hoping to capture some migrating trout jumping. It’s been a strange season and the water is still quite cold, so, no luck there. On top of that, the fishing season just opened and the usually quiet shores were lined with a continuous row of fishermen, some friendly and welcoming, others, not so much. I know this is but a brief moment in time and soon calm will return once more. We left the creek and drove a few miles north to the East Duffins Creek Headwaters trail, for peaceful walk in the woods, pictured above. The trails are lined with red pine and a mix of hardwoods. This area is at a slightly higher elevation and wildflowers were a bit more sparse. Despite that, we had a great time walking and catching up. How’s your week been? This entry was posted in Landscape, Nature, Photography, weekendcoffeeshare and tagged EDCHW, forest, hike, Nature, ontario, painterly, peaceful, Rainbow Trout, spring, Susan Polis Schutz, TRCA_Trails, Uxbridge, weekendcoffeeshare, Whitevale on April 23, 2016 by Ed Lehming Photography.